Is DLF a Buy or Sell Candidate Now? DLF has gone through numerous ups and downs and latest being Robert Vadra land acquisition case who happens to be Son-in-Law of Sonia Gandhi and a charge of favouritism and nepotism was levelled and DLF was party to it. Notwithstanding that market spares none and DLF saw its lowest ebb and same can be seen in the chart below. Now land acquisition bill has given a shot in the arm as it will increase the land cost but the project certainty is for sure and stock is now showing all the positive signals for an upmove. The stock has triggered a buy signal by the break up through the resistance at 160 rupee in a double bottom formation. Initiate the buy only if stock maintains momentum above 160 level. Please note that below 160; you need to sell the stock for tgt 150,135 level. 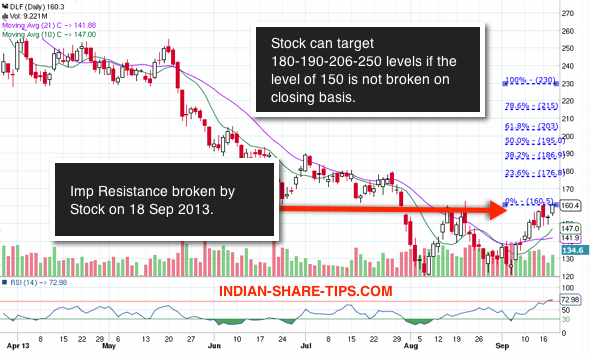 Target : The stock can target 180-190 levels within a period of 60 days. The likely Fibonacci levels are as indicated on the chart. You can use the Fibonacci FreeTool to get the levels for stock which are more often correct as History repeats itself. This analysis is made on 18 Sep 2013 and thus date be kept in mind while viewing the chart for technical perspective and our clients are long in this stock. Just remember that technical analysis is a flexible thing and not permanent and on same stock we had initiated a DLF sell call and remember that you have to trade with the trend and not fight it.